I read these two scriptures because they correspond with the impression we had this morning as to the Lord Jesus and His bride being "without spot." Our brother read in Song of Songs as to the bride: "thou art all fair my love, and there is no spot in thee", and as to Jesus typically: "yea, he is altogether lovely." And I am impressed with the Lord Jesus' spotless offering. 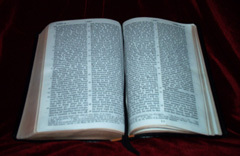 In the epistle to the Hebrews, there is much detail as to the Old Testament law, and the writer makes many assumptions as to persons understanding the Old Testament types, which are not presented in the same way in other New Testament epistles. But that's fitting, because he is writing to Hebrew saints who would be acquainted with the types and the tabernacle system, and the writer would expect them to know of the insufficiency of the tabernacle system and the offerings that are specified by the law of Moses in the old covenant. The tabernacle system, and the offerings of goats and calves and so on, were very imperfect. "Goats and bulls, and a heifers ashes" are typical, and they look forward to the perfection of this one offering: the Lord Jesus, "who by the eternal Spirit offered himself spotless to God." All these Old Testament offerings were merely provisional, but the Lord Jesus has effected an eternal redemption. We read in verse 15, "death having taken place for redemption of the transgressions under the first covenant." Thousands and thousands of sacrifices were made, no doubt, as the Israelites lived through that long period from when Moses received the commandments on the mount until the temple was destroyed by the Gentiles. Each time a person sinned, he had to bring a sin-offering, which the priest would offer to God for that sin, and his conscience would be cleared from that sin. But in Hebrews 9 we read of one Offering which has an eternal bearing. We read the word "eternal" three times in this section: verse 12, "having found an eternal redemption"; verse 14, "who by the eternal Spirit offered himself spotless to God"; and verse 15, "the called might receive the promise of the eternal inheritance." The writer is stressing the precious difference between the offerings in the Old Testament which were good for one sin, and then only in a provisional way, and which anticipated the perfect offering of the Lord Jesus once for all. He bore the sins of many, and He did it once for all. His perfect offering has an effect on all mankind. His sacrifice is available to meet every sin which any of us has committed, and it accomplishes an eternal redemption! Well, how wonderful that offering is! But it could only be so if it were a perfect offering. It could not have any spot in it; it could not have any flaw in it. One requirement for the animals that were offered in the Old Testament was that they have no defect. The Israelites were not permitted to bring an offering that was defective — an animal that, perhaps, had a missing leg or was blind in one eye. They could not bring that as an offering to God. And that all looks forward to the perfection of the offering of Jesus. So it says here that "how much rather shall the blood of the Christ, who by the eternal Spirit offered himself spotless to God, purify your conscience from dead works to worship the living God?" Without the shedding of blood, there is no remission. The priest would do that with the offering that the Israelite brought. He would slay it, use a knife to sever its neck, and the blood would flow out, and it would be for the remission of that person's sin. But the Lord Jesus was both the Priest and the Offering. He was both the Offerer and the Offering. It goes on to speak of Him as the "mediator of a new covenant." Just speaking simply, a mediator is a person who stands between two persons and settles their differences. In the course of business affairs, two persons might disagree as to the terms of a contract, and their fulfillment. Well, a mediator might get involved, who would work things out between them and settle the differences. That is a simple illustration of what the Lord Jesus has done. Because man, by sin, has gotten far away from God. After God created man in Genesis, man sinned and hid from God, and God said, "Where art thou?" Thus, sin entered into the human race. And how far away man has gotten from God as a result of sin! But now we have a Mediator, One who is both the Priest and the perfect Offering, and the One who, as Job says, can put His hand on man and also be in perfect relation with God, and He can perfectly remove the distance between God and man. So it says that "the called might receive the promise of the eternal inheritance." How precious is the perfect, spotless offering of the Lord Jesus! It's not only for one sin, and it's not only for one sinner, but it's available to meet your need; it's available to meet my need, and indeed He suffered to bear the sins of many. He "bore our sins in His body on the tree." 1 Peter 2:24. The Lord Jesus has met our need, but it is in view of God having a response too. The sacrifice which the priest offered in the Old Testament was to meet man's need, but the blood was to be in the sight of God. That was for God. It was in view of God having an answer. The blood of the Christ purifies our conscience from dead works to worship the living God. The perfect offering of the Lord Jesus thus meets man's need and it brings in a wonderful result for God, in worshippers: the persons whose need has been met become worshippers of God. Then I thought that we might touch on this passage in Ephesians, which tells us how the perfect sacrifice of the Lord Jesus has brought about a perfect answer to His own heart. "Christ also loved the assembly, and has delivered himself up for it." This is similar to what we read in Hebrews, where He "offered himself." Here, it says He "has delivered himself up." He is both the Deliverer and the One who is delivered up, for the assembly. In Hebrews, "purifying our consciences" is an individual thing. But here, we read of the assembly, His bride: "in order that he might sanctify it, purifying it by the washing of water by the word, that he might present the assembly to himself glorious, having no spot or wrinkle or any of such things, but that it might be holy and blameless." There is to be what is without spot, without wrinkle, without any defect, that can answer to the heart of Christ, as a result of His love in delivering Himself up for the assembly. Paul writes here of a practical side too, as to our relations with our wives. He says, "Husbands, love your own wives", and he uses the way the Lord Jesus has delivered Himself up for the assembly as leverage in our hearts, as to our relations with our wives. He goes on to say, "So ought men also to love their own wives as their own bodies: he that loves his own wife loves himself", and so on. Do we have an impression of the Lord Jesus' love for His bride, His assembly? And would this not help us in our relations with our wives? Do we love our own wives, even as the Christ also loved the assembly, and has delivered Himself up for it? It's a sacrificing kind of love, isn't it? It's not just a casual love, not just saying "I love you"; we husbands are to love our wives as the Lord Jesus has loved the assembly. I believe we have all been affected by the glad tidings and the way the Lord Jesus has loved us and delivered Himself up for us. And the Lord Jesus would have those who are affected by the spirit of the glad tidings to have this character of affection for our wives. We know there is the admonition for wives to submit themselves to their own husbands, but the great leverage that the apostle Paul uses here is the fact that the Lord Jesus loved the assembly and delivered Himself up for it. And he uses it to affect us in our relations with our wives. We have a young brother locally whose wife is estranged from him. What a sorrow that is! And I think the Lord would just give us a word as to what are our relationships with one another. We've been affected too by the family relations that the apostle Paul speaks of in 2nd Corinthians: "Come out from among them and be separate, and I will be to you for a father, and ye will be to me for sons and daughters." Divine Persons would seek to engender real and living and loving family relationships amongst His dear people. And may we be encouraged in these few thoughts, because they're based on the glad tidings and the way the Lord Jesus has loved us to begin with. Warren, New Jersey, USA. September 5, 1993.